Remade for the PS4, the first person survival horror game intrigued me with its Korean setting which reminded me of my own time growing up in the country. White Day in Asia takes place a month after Valentines and is a day when men give gifts to women to reciprocate the Valentine’s gift they received earlier (women often buy chocolates for men on Valentines). 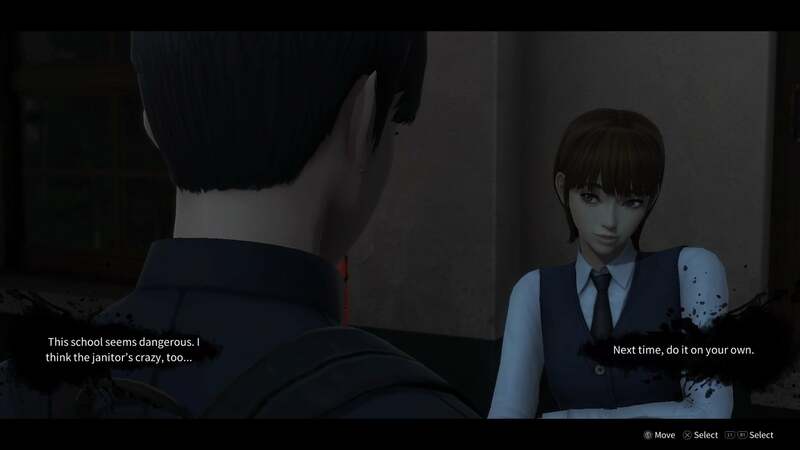 In White Day: A Labyrinth Named School, you play as Lee Hui Min, a student who wants to give a gift to his love interest/crush, So Yeong, as well as return her diary, which she’d lost. Unfortunately, you couldn’t have picked a worse time or place to visit. Yeondu High School is brimming with the souls of the damned, many of whom were grievously wronged during the Korean War as the grounds used to be a hospital (an estimated 2.5 million civilians were killed during the Korean War). The ghosts pop out from the lockers and lurk behind windows, unnerving sound effects bombarding your senses on every turn. One of the most intriguing parts of the game is that you actually learn their stories through notes, much of it painfully interwoven with the school’s bloody history. For example, the Girl Outside the Window is a ghost who died after waiting for an unrequited love at a cursed pond. This pond was said to have been the site of a refugee tent during the Korean War that had been bombed, leading to the deaths of all those within. There’s also a Haunted Head Ghost who will often pursue you; she’s a woman who was killed in a construction accident by decapitation at the school. When the workers realised what had happened, they buried her body in the cement and tried to cover it up, but couldn’t find her head until much later. The headless phantom is the spectre that lunges you at unexpectedly throughout the game. I wanted to know more about the history regarding the master of the Labyrinth, a woman named Seong A, and how a fiery demise and a ritual of human sacrifice gone awry led to the channelling of all the evil within. But I was surprised to learn that the biggest threat weren’t the numerous spirits that haunted the classrooms. It was the school janitor. The janitor is like a human version of the Nemesis from Resident Evil 3. He is relentless as he chases you and beats you with his bat. There’s never any aim or purpose, never any understanding of why he’s so outraged. The first time you see him, he violently beats a student. You’re not given any weapons and once he sees you, it’s very difficult to elude him. There were moments I swore I was perfectly hidden, only to hear his shrill whistle before I was pummelled to death. The feeling of injustice was overwhelming to the point where it made the spirits seem less eerie. I was freaked out by the thought of getting caught by the janitor more than bumping into any of the ghosts. While the game has released several patches to better balance the janitor’s difficulty level, he still is death incarnate. No wonder all those spirits are so angry and their feng shui has gone haywire (you later learn a teacher in the past had the evil spirits possess the two janitors to prevent anyone from encroaching on the amulets protecting the school). Much of the game is comprised of obscure puzzles that, for the most part, have clever designs. Unfortunately, I found myself continually irritated by the janitor. The visuals are also a bit lacking as it looks like something that was made for an older generation game (my last two survival horror games were Resident Evil 7 VR and Until Dawn, both of which were graphically stunning). 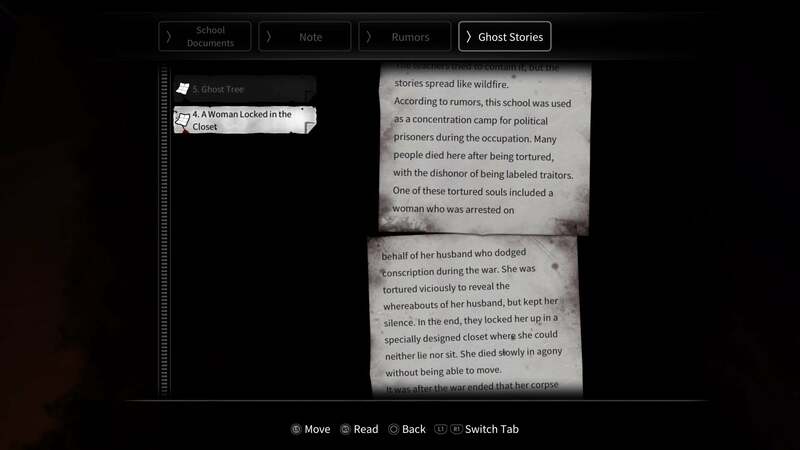 But it was the way the school’s individual ghost stories reminded me of my time growing up in Asia that kept me going. I’ve written before how I lived in Korea for two years, attending school there during that time. I barely spoke any Korean, and was forced to learn quickly. While I had a hard time with the language, when I was finally able to make friends, one of the things I most remember are the ghost stories they’d tell me. We’d meet up after school, eat instant noodles, and scare the crap out of each other with these tales. I remember one about a student who killed himself by jumping off a building, landing head first. He haunted the school and when one of the students who was staying at a dormitory started hearing a thump, he hid under his bed. Unfortunately, he realised too late that the ghost was hopping on his head and they were staring at each other eye to eye. Many of the stories have a strange moral to them and some fall into the category of urban legend. I remember I heard that if you leave your chair out when you sleep, a wandering ghost will sit down and watch you while you sleep. It’s been almost three decades since I heard that, but I still make sure all my chairs are tucked into the desk or table. 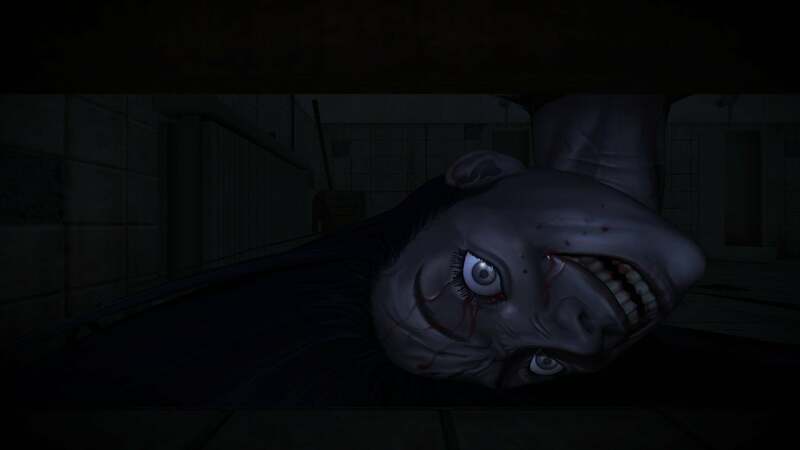 So listening to White Day’s audio in the original Korean track and experiencing these new and horrifying ghost stories was like a trip back to the apparitions of my childhood. It was an uncomfortable feeling that unnerved me in a good, masochistic kind of, way. There are many unique stories in Korean literature and gaming, and I hope to see more games that focus on those narratives here in the West. While White Day’s gift isn’t perfect, there’s enough there that, hopefully with a few patches, make this a day worth enduring.